June | 2013 | Run. Work. Live. Repeat. See K.C. Run and BorB is Back! Me and K.C. Compton, moments after she finished the See Jane Run Half Marathon — her very first half marathon — June 8, 2013, Alameda, Calif.
First off, WELCOME to the NEW Boston or Botox, now on WordPress! The reasons for my long hiatus were: 1) I was in the process of converting this blog; and 2) It’s been summer. My kids were home while I’m also working; and my life has been busy and chaotic. But I’m back now and just like Rocky Balboa, in fighting form and better than ever! If there’s one thing that defines a runner — most of us, anyway, it’s our ability to “Rocky up” and persevere. Yes, while most of us challenge ourselves to go LONG in the process, it really is more about how FAR we’ve come when we look at where we began …. On that front I have two accomplished to talk about today. This summer I not only learned WordPress, but on June 8, 2013, I coached an old friend, K.C. Compton, through completing her first half marathon ever. 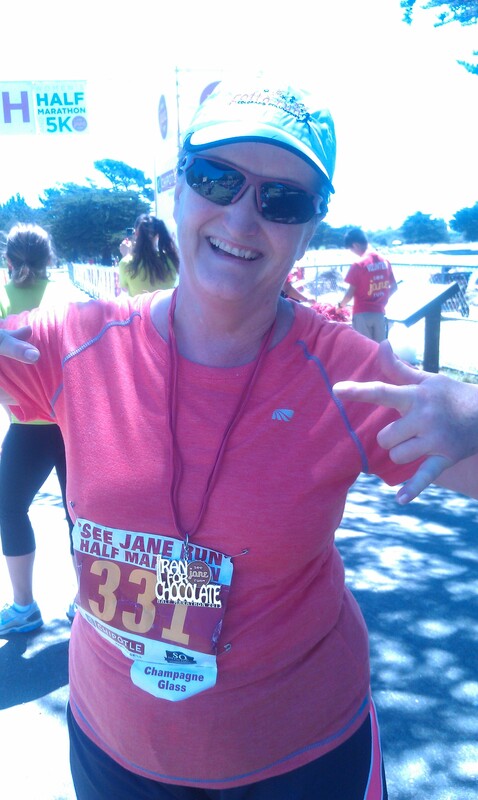 Here she is at 64 and fabulous and a half marathoner FINISHER! Back in January she contacted me to be her coach. At that point she’d never gone farther than a 5K. She asked me if I thought she could do it. My answer was clear: Absolutely! The other quality I believe defines most runners is our audacity and K.C. is someone I’ve always known to possess it in truckloads. After she hired me on she was a pleasure to coach. Throughout the years I’ve known her (almost 20), K.C. has donned many hats: Single, working mom; newspaper columnist; returned college student and grad (in her late 40s); musician and performer; newspaper managing editor, and most recently, senior magazine editor for Mother Earth News. I’ve always considered it a blessing to know her and she continues to inspire me today. And now she bear a new title: RunnerGirl! I am so proud of her and honored to be her friend AND coach. So what’s happened with K.C. since her big accomplishment? She got back on the training band wagon and was doing OK for a few weeks. Then, unfortunately, she experienced another real-world runner lesson. She got injured and sprained her ankle during her next phase of training. She’s now recovering and working her way back to Rocky fighting form. It was tough for both of us when it happened but she got medical treatment right away and I know she will be OK. She’s one of the most “coach-able” I’ve met and she’s already on her way to getting better. 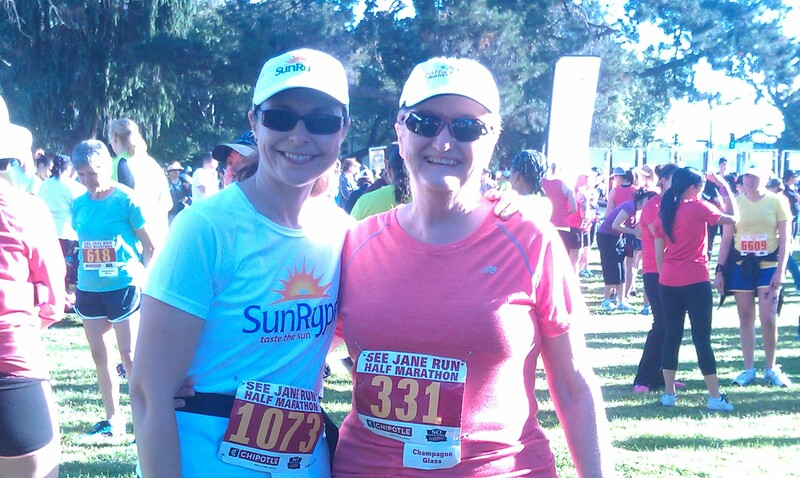 She is setting her sights on a sprint triathlon for next year. I believe we’ll get there again healthy, safely and gradually. As for me — the blog conversion is done. I signed up for the Tucson Marathon and I’m in the process of getting myself back in true physical Rocky fighting form, too. Now that the blog is on WordPress and the kiddos are back in school, I am ready to pick Boston or Botox again. I have several profiles in the works. I can’t wait to see how FAR I and Boston or Botox will go next. “Aging is inevitable, but growing old is a choice. Lace up your shoes, and let’s go!